Muscle tissue is specialized for contraction. There are two chief categories of muscle: striated and non striated muscle (smooth muscle). Sometimes muscle is categorized as three types: skeletal, cardiac, and smooth. Striated muscle can be sub-categorized into cardiac muscle and skeletal muscle. Both skeletal muscle and cardiac muscle have visible striations. Collectively, skeletal muscle and cardiac muscle are classified as "striated muscle". Skeletal muscle is responsible for skeletal movement. The central nervous system (CNS) controls the skeletal muscles. Skeletal muscles are under conscious, or voluntary, control. The basic unit of a muscle is the muscle fiber. Skeletal muscle fibers are multinucleated. On a histology slide, it can be seen that the nuclei are located on the periphery of the cell. These muscle fibers are striated. The heart is composed of cardiac muscle. Myocardium is the muscular layer of the heart. Thus, the myocardium is composed of cardiac muscle. Cardiac muscle is under control of the autonomic nervous system. The contraction of cardiac muscle is involuntary, strong, and rhythmical. The cardiac muscle cell is rectangular in shape. On a histology slide, it can be seen that the cardiac muscle cell has one central nucleus, like smooth muscle, but it also is striated, like skeletal muscle. In cardiac muscle, the nucleus is located centrally. Histology hint from Sarah Bellham: This is an important point, as both skeletal muscle and cardiac muscle are striated. The centrally placed nucleus seen in cardiac muscle is one of the things that can be used to distinguish between the two. On a histology slide, branching cells are seen in cardiac muscle. 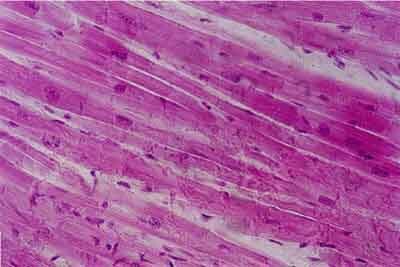 Histology hint from Sarah Bellham: this is an important point, as both skeletal muscle and cardiac muscle are striated. The branching seen with cardiac muscle is one of the things that can be used to distinguish between the two. When examining the histology it can be seen that occasionally, cardiac muscle is bi-nucleated. Intercalated discs are seen in cardiac muscle. Intercalated discs are specialized junctions between cardiac cells. Non striated muscle is also called smooth muscle. Smooth muscle is found in the walls of the hollow internal organs such as blood vessels, the gastrointestinal tract, bladder, and uterus. Smooth muscle is involuntary muscle. Smooth muscle is under control of the autonomic nervous system. Smooth muscle cannot be controlled consciously and thus acts involuntarily. Smooth muscle contracts slowly and rhythmically. Smooth muscle is composed of spindle shaped cells. In smooth muscle, there is also a centrally placed nucleus. The outer connective tissue covering of a muscle is the epimysium. 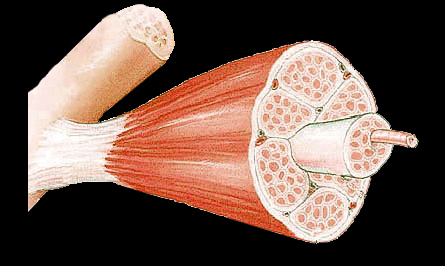 Within the muscle, there are subdivisions called fascicles. The perimysium surrounds these muscle fascicles. The endomysium is the covering around an individual muscle fiber. Histology hint from Sarah Bellham: The prefix "peri" means around, such as in the word "perimeter". The prefix "endo" means within or inner, such as in "endosteum","endocrine", "endoscope". The sarcolemma is the plasma membrane of a muscle cell. The sarcoplasm is the cytoplasm of a muscle cell. The muscle cell is a muscle fiber. The term "muscle cell" and "muscle fiber" are synonymous. A myofibril is a longitudinal bundle of myofilaments within a muscle cell. Myofilaments are the contractile protein within a muscle cell. The myofilaments are actin and myosin. The thin filaments are actin and the thick filaments are myosin. All types of muscle contain actin and myosin. On a cross section of a muscle, each thick filament is surrounded by 6 thin filaments. A sarcomere is the segment that runs from Z line to Z line. Both skeletal muscle and cardiac muscle have sarcomeres. Smooth muscle has no sarcomeres. The A band is the darker staining band. The I band is the light band. The I band is made of thin filaments. The Z line runs through the I band. The H band bisects the A band. The M line runs through the H band. A single motor neuron and the aggregation of muscle fibers innervated by that single neuron is called the motor unit. A motor neuron is a neuron which innervates a muscle cell. The point of contact where a neuron contacts a muscle is the motor end plate. A neuromuscular spindle is a receptor which is sensitive to stretching of the muscle. A neurotransmitter is the chemical released by a nerveat a synapse. Skeletal muscle fibers can be classified as red fibers, white fibers or intermediate fibers. Red fibers are smaller in diameter; white fibers are larger in diameter. Red fibers have more mitochondria than white fibers. Red fibers make up slow-twitch muscle; white fibers make up fast-twitch muscle. Red fibers are more resistant to fatigue than are white fibers. Red fibers have more myoglobin (oxygen binding pigment) than white fibers. White fibers store glycogen and use anaerobic metabolism. Red fiber and slow twitch muscle is for endurance. White fiber and fast twitch muscle is for a burst of power. Muscles are attached to bones by tendons. Size, shape, direction of fibers, location, number of origins, origin and insertion, and action are characteristics that are used in naming muscles.